B-17 radioman Thomas Fitzpatrick helped drop bombs over enemy territory from Foggia, Italy. The bomber’s radioman, Technical Sergeant Thomas Fitzpatrick, opened the bulkhead door to the bomb bay and saw the two remaining bombs. He reported it to the crew then took off his headphones and grabbed a screwdriver before entering the open bay as the bomber cruised at 250 miles per hour. Fitzpatrick wore no parachute, and no rope kept him from falling out. The only thing connecting him was the tube attached to his oxygen mask. Walking gingerly along the eight-inch-wide catwalk down the center of the bomb bay, Fitzpatrick grasped onto handholds to keep his balance. “You could see the farmer with the pitchfork waiting for you,” he later mused. When he reached the bombs, he pushed the screwdriver into the holes in the upright bomb racks until the bombs dropped out. “It was a pretty hairy thing,” he said. With the bomb racks now empty, he worked his way back to his radio station and returned to duty. The task had only taken about a minute. Fitzpatrick and his crew were part of the Fifteenth Air Force, 2nd Bombardment Group, 96th Bomb Squadron—the “Red Devils”—one of just six B-17 groups flying out of Italy, dropping bombs on German targets across southern Europe and dueling with the depleted Luftwaffe. As the radioman, Fitzpatrick sat at a desk on the left side of the fuselage between the bomb bay and the ball turret and waist gunners. To his left was a small window and above him large one. 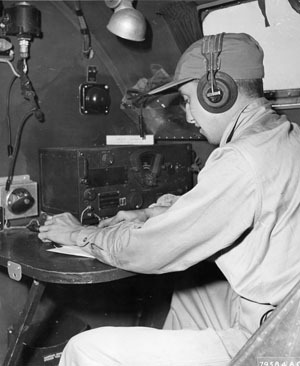 He sat facing forward, using the shoeboxsized radio on his work desk to send after-action reports in Morse code or receive new targets if the primary target had changed. He was also the bomber’s designated first aid man. His other duties included visually confirming a successful bomb drop and, of course, prying unreleased bombs from the bomb bay. Once he finished school, Fitzpatrick landed a job as a lab assistant at a local U.S Department of Agriculture lab, where he worked on projects like acrylic rubber, a bulletproof material that would not disintegrate in oil or gasoline. When the Army Air Forces began accepting non-college graduates, he took the aviation cadet examination. After scoring a 99, he went to Keesler Army Airfield in Mississippi for infantry training. He was soon detached to Moorhead State Teachers College in Minnesota to learn to fly Piper J-3 Cub training planes. “It was a breathtaking experience,” he said. Aside from flying, Fitzpatrick worked another job, one that focused on the field’s strict military training: he became the base bugler. “Every morning I played Reveille and [To the] Colors.” He played bugle for the next three months, often playing Taps at military funerals. Next, Fitzpatrick went to Santa Ana Army Airbase, California, for his classification. He did not make pilot or bombardier, so he selected radio operator, an enlisted rank. He then traveled to Scott Field, in Illinois, for radio training. He learned to use the radio’s knob to find the correct frequency by listening through his headphones for a whistle that went down and then up again. “You wanted the null between the high and the low pitches,” he explained. Once he had the frequency, he could switch his radio from intercom to inner squadron and back to wing headquarters. Fitzpatrick could tap out 25 words a minute in Morse code, but he would never use the inner squadron option. “The pilot just used his voice,” he said. The radio contained a small magnesium bomb inside. If his plane were going down, Fitzpatrick had to press a special button on the radio, and it would begin to burn. He would then put all his radio codes into the open back of the radio to ensure their destruction. Gen, Nathan Twining talks to a B-17 crew. He was not bragging. When his team made Crew of the Week at McDill Air Force Base, Florida, they were rewarded with flying the famous Memphis Belle, the first B-17 to survive 25 missions with her crew intact, to New York City for a War Bond drive. “The plane was fairly rickety,” recalled Fitzpatrick. Unfortunately, as the bomber approached New York clouds rolled in over the city. Foos, who had not yet been trained on instruments, had to land in New Jersey, where the men spent a few days before returning to Florida. While they waited, mechanics installed rubber fuel tanks in the bomb bay to help complete the ocean flight. Fitzpatrick recognized them as acrylic tanks, the same material he had worked on as a civilian. “Here I am a year later and we had bulletproof gas tanks,” he recalled. Eventually, the squadron took off for the Azores, more than 850 miles west of Portugal, but Fitzpatrick’s bomber stayed behind with mechanical trouble. With reports of German raiding parties being landed by U-boats to plant bombs in the bombers, Fitzpatrick and his crew took turns sitting in the cold plane and clutching Tommy guns. Finally, on December 2, the weather cleared and a strong tailwind blew in. With the navigator, Malcom Sharpe, hung over from a night of drinking, the men threw him into a shower, fed him coffee, and loaded him into the bomber. They took off. Fitzpatrick contacted the Azores, and the plane flew on across the ocean. Fitzpatrick had to act as both radioman and navigator while Sharpe recovered. The trip proved uneventful. “It’s awfully lonely over the Atlantic all by yourself,” Fitzpatrick admitted. Fitzpatrick used his radio compass to navigate the bomber, contacting the Azores and a station in Iceland and giving them his latitude and longitude so they could give him a heading, which he gave to Foos. As they approached the Azores, Sharpe recovered and resumed his navigation duties. “I guess he wanted to put something into his log book,’ said Fitzpatrick. The bomber headed for Lajes Field, a clifftop base on the edge of Terceira Island. The bomber’s altitude went from a couple hundred feet to almost zero in seconds. Not realizing this, Fitzpatrick failed to reel in his antennae, which tore off as the plane touched down. “I got a few words from the major who met us,” Fitzpatrick recalled. From the Azores, the men flew to Marrakesh in French Morocco. As they taxied down the runway, a regiment of French Foreign Legionnaires (FFL) presented arms on the tarmac while a band played “La Marseillaise.” The Frenchmen cheered their American friends with “Vivé le morté! Vivé l’guerré! Vivé l’legion Etrangere!” (Hurray for death! Hurray for war! Hurray for the Foreign Legion!) That night Fitzpatrick dined on horse and camel meat. Fitzpatrick operated the B-17’s radio as shown. From Marrakesh, the crew flew across North Africa to Tunis and then to southern Italy, eventually making it to Amendola Airfield between Foggia and Manfredonia on Italy’s Adriatic coast on December 9. There they joined the Fifteenth Air Force, 2nd Bombardment Group, 96th Bomb Squadron. The Fifteenth consisted of 15 B-24 Liberator groups of 72 bombers each and six B-17 groups of 96 bombers each. Anywhere from 700 to 1,000 bombers could get aloft for missions over enemy targets. Although Italy had turned against its Nazi partner more than a year earlier, Fitzpatrick noticed that fliers still wore their sidearms. Earlier in the Italian campaign, American bombers flying out of North Africa had hit the area. Prior to the raid, they had dropped leaflets warning the civilians to take cover. Unaware of the Americans’ target, local civilians packed into the railroad yard’s underground bomb shelter, not realizing they were in the raid’s bull’s-eye. Bombs hit the yard, destroying gasoline-filled tank cars. The fuel flowed into the shelter and exploded, killing almost everyone inside. Despite the warning, the locals blamed the Americans for the heavy toll. “It was a little on the hairy side,” said Fitzpatrick of the area and its citizens. By the time Fitzpatrick’s crew arrived at their new home in December 1944, the war had shifted decidedly in the Allies’ favor. The Western Allies had liberated most of France and entered Germany, although Adolf Hitler was about to launch his Ardennes Offensive—the Battle of the Bulge. The Soviets had driven the Germans out of their country, as well as Lithuania, Bulgaria, and Albania. The advancing Soviets had also taken huge swaths of Latvia, Estonia, Poland, Yugoslavia, Czechoslovakia, and Hungary. Back in August, King Michael of Romania had staged a coup against the pro-German government and surrendered to the Russians. The oil refineries of Ploesti, which had been the target of so many Allied bombing attacks, were now in Allied hands. In Italy, Rome had fallen to the Western Allies on June 4, 1944, during an advance some 300 miles up the Italian boot. Despite the diversion of men and materials to the invasion of southern France and operations in Greece, the Allies had penetrated the German Gothic Line. There was, unfortunately, no decisive breakthrough, so they fought an offensive defense to keep the Germans from fortifying other fronts. When Fitzpatrick and his crew touched down in Italy, the Allies were still 100 miles south of the Po River, the last natural barrier into central Europe. After deplaning, Fitzpatrick’s crew had no tent to sleep in, but when a bomber blew up on the runway, killing its crew, Fitzpatrick and his men occupied the dead crew’s tent. “That’s when we realized that we were at war,” he said. Fitzpatrick’s crew received a war-weary B-17F, the Great Speckled Bird,so named for the bomber’s numerous patched flak holes from previous missions. Before his first sortie, Fitzpatrick got a little absolution, and a laugh. On Christmas Eve, despite a heavy downpour, he and 3,000 other airmen packed the San Lorenzo Maiorano Cathedral in Manfredonia. Airmen gave generously during the collection, creating a huge five-foot-tall pile of money in front of the altar. Then a pyrotechnic wire-guided dove model swooped down the center isle and exploded over the pile, setting the money on fire. Three airmen quickly doused the fire with their wet coats. The men in the pews cheered. For their first mission, just before Christmas 1944, Fitzpatrick’s crew bombed the small town of Castlefranco Veneto, northwest of Venice. Only a small amount of enemy fire—all flak from antiaircraft guns—greeted them. “It was a milk run,” he explained. Despite the milk run aspect of the mission, Fitzpatrick learned to do his job in combat. “Once we got into enemy territory we kept radio silence,” he said. The Alps, separating Italy from central Europe, stood as the marker for going quiet. After the bombs dropped, he sent his crew’s bomb report in Morse Code. The crew wore Class A uniforms, including neckties. “The Germans were conscious of rank,” explained Fitzpatrick. “We had to impress them if we were captured.” Over their uniforms they wore insulated, electrically heated suits that plugged into sockets in their seats. Heated gloves and boots snapped into plugs on the suits. Early on, the crews wore British heated boots, which were so cold they turned up the heat in their suits to the point of burning just to warm them. Finally, they were issued American-made heated boots inside their fur-lined covers. For extra protection, Fitzpatrick wore a Saint Christopher Medal—Christopher being the patron saint of travelers —and a Miraculous Medal, which would help believers obtain grace with the help of the Virgin Mary. Before every mission the men received survival kits containing a compass, maps, $1,000 in gold notes, and other important items, which they wore in a pocket below one of their knees. The kits were strictly accounted for, and each crewman had to return his after every mission. Crews also received the names of German prison guards who could be bribed, information brought back from those who successfully escaped German prison camps. Staff officers briefed the pilots and radiomen separately before every mission. 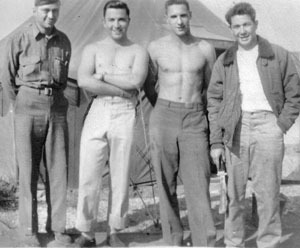 Fitzpatrick and the other radiomen received daily codes and weather reports. The pilots, navigators, and bombardiers received targets and secondary targets. Surprisingly, the only other person who knew the wing’s destination was Axis Sally, the American-born woman employed by the Nazis to lower GI morale. Her programs mixed popular American music with propaganda and threats. “You’re coming up to Wiener Neustadt [Austria] and we’re ready for you,” Fitzpatrick remembered hearing her say over the radio. Every briefing ended with the men synchronizing their watches to keep accurate time and to ensure all elements of the mission were coordinated. 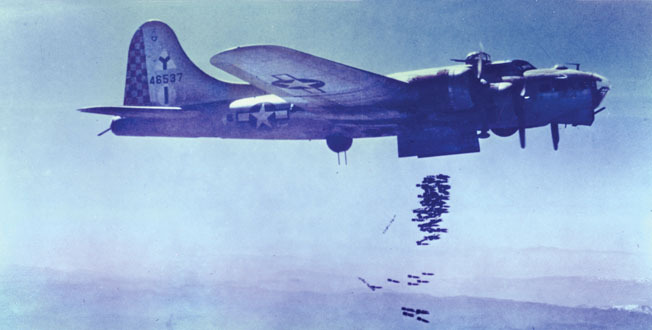 A B-17 bomber from the 69th Bomb Squadron drops a load of fragmentary bombs over a target in Italy. Fitzpatrick had to climb into the bomb bay and pry lose any bombs that failed to drop. Like many planes late in the war, Great Speckled Bird was unpainted and showed its silver aluminum body. Camouflage had proved ineffective for disguising the planes on the ground, especially since the Luftwaffe rarely flew over the air base. The parasitic drag of camouflage paint also slowed the bombers. “You could get additional speed without it,” explained Fitzpatrick. As the bombers lined up and headed down the runway, the squadron chaplain would stand in the back of his jeep and give absolution to the crews as their planes lumbered into the sky. Fitzpatrick liked his chaplain, but it bothered him that there were never services for lost crews. Once the planes formed up and headed to their target, Fitzpatrick would sometimes receive messages from wing headquarters to change targets, usually because of clouds or because a target of opportunity suddenly became available. He provided the new information to the pilots and navigator, who would make the necessary course corrections. The missions usually lasted about 10 hours, yet there was almost no down time on a flight. “We were constantly on the lookout for enemy planes,” he explained. The targets themselves could prove surprising. On one run over a small town at 18,000 feet, the group dropped bombs on some storage buildings. “There were huge explosions,” said Fitzpatrick. “Green and yellow clouds of smoke came from whatever they were making in the factory.” Usually, exploding buildings created white clouds, while oil refineries produced black. The men had hit a hidden chemical complex. The planes’ tails were painted red. Fitzpatrick knew that meant they were Tuskegee Airmen, the African American fighter unit, men who had to fight just to get into the war in a segregated military. “We knew they were based not far from us,” he said. “We would see them make barrel roles over the airstrip if they made a kill.” The two fighter pilots protected the Great Speckled Bird all the way back to Amendola. 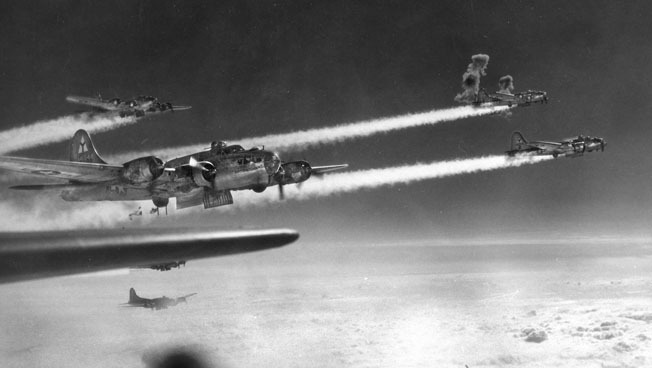 With flak bursts exploding in their midst, B-17 bombers of the 69th Bomb Squadron head to their targets over Austria. Fitzpatrick narrowly escaped death when two chunks of flack shot through his bomber’s fuselage, almost hitting him. 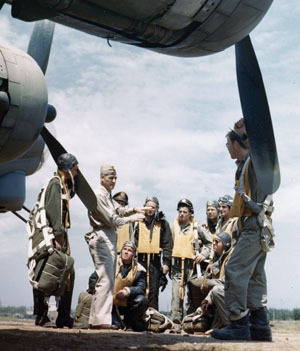 Whenever downed airmen made it back from enemy territory, the crews were debriefed. One group showed up in civilian clothes provided to them by partisans. While traveling out of the occupied area in a train, one of the crewmen rested his feet, still clad in American boots, on a small heating stove. A passing civilian told him that the letters “US” were branded on the bottom of his boots. The civilian did not report the American, but the word went out to the Fifteenth Air Force to correct it. “Everyone had to get a red-hot poker and eradicate the ‘US’ on the bottom of their boots,” said Fitzpatrick. With Russian-occupied Hungary now on the Allied side, the town of Sopron provided the Americans an emergency airstrip. Fitzpatrick’s crew landed there once when they ran low on fuel. They found the airbase run by women and 12-year-old boys. “Kids jumped on the wing and refueled,” he said. “These old ladies would pick up two [50-pound] packs with parachutes and flight suits in them.” That night, the crew dined on cabbage and potatoes. German planes and flak frequently hit the bombers. German Messerschmitt Me-109s would fight through the fighter escorts to shoot down B-17s. As the end of the war neared, Fitzpatrick and his crew started seeing a strange new fighter plane with a bat-shaped wing and no propeller. It was the Messerschmitt Me-262, the first operational jet of the war. “We didn’t know what the hell they were,” said Fitzpatrick. “I could see them traveling much faster than usual planes.” On a mission over Munich, rocket-firing 262s had to fly a large circle to get into a firing position behind the bombers. Emsley, the tail gunner, realized their tactic and shot one down. While enemy planes did not show themselves on every mission, antiaircraft fire did, and there was no defense against it. “Flak was getting more intense all the time,” said Fitzpatrick. “You could get out and walk on it.” Once while sitting at his desk an antiaircraft shell exploded outside his window and a piece of flak tore through the fuselage just behind the window. Fitzpatrick instinctively jerked his head back. Just then, a second piece blasted through the hole made by the first and shot through the bomber, tearing out the other side. “That was a narrow escape,” he recalled. Although flak never wounded Fitzpatrick, the plane would sometimes touch down at Amendola with as many as 60 holes in it. Fitzpatrick’s ball turret gunner was not so lucky. “I’m hit!” Joe Martin called out just after dropping bombs over Austria. Fitzpatrick unhooked his oxygen tube and dashed back to the ball turret. He had just opened its lid and pulled Martin up when he passed out from lack of oxygen. One of the crewmen hooked up Fitzpatrick with a walkaround oxygen bottle, and he came to. They then pulled Martin into the radio room, where a recovered Fitzpatrick tried to help. They laid Martin on his belly, exposing a large wound in his buttocks. Although the ball turret seat was armored, Fitzpatrick knew Martin always sat high in the turret, exposing his bottom. First, Fitzpatrick cut Martin’s heated suit to access the wound, cutting off his heating circuit in the process. The men rotated their gloves and boots to Martin to help keep him warm. Once the plane passed over the Alps, Foos dropped the plane down to a warmer altitude, and Fitzpatrick went to work. He found a piece of flak the size of a fist imbedded into Martin’s left buttock and pulled it out. He then sprinkled sulfa powder into the wound. If Martin had been in pain, Fitzpatrick would have given him a morphine shot, but the gunner remained calm. When the bomber arrived over the airfield, the flight engineer, Grover Themer, fired a red flare into the sky indicating that they had a wounded man aboard. Wing headquarters rerouted the bomber to an airstrip next to the 61st Station Hospital at Foggia. As the bomber taxied down the runway, an ambulance raced alongside. When it came to a stop, the crew helped load Martin into the ambulance for the trip to the hospital where doctors picked several personal items that he had kept in his back pocket out of his wound. When the crew returned to their airstrip, one of the ground crewmen pried a piece of flak out of the ball turret and gave it to Fitzpatrick to give to Martin. “He didn’t fly anymore,” said Fitzpatrick. It had been Martin’s 12th mission. The crew received a new ball turret gunner. Then the engine caught fire. Copilot Robert Clarke pulled the lever on a CO2 fire bottle in the wing to extinguish the flame. Fitzpatrick could still see flames and told Clarke it had failed, so Foos rang the bail out bell. Everyone put on their parachutes, knowing if Foos rang it again they would have to jump. Clarke pulled the lever on the second CO2 fire bottle. This time the flame went out. As the bomber flew over the Alps, another engine failed and had to be feathered. Foos managed to get the plane up to 18,000 feet to cross the Brenner Pass, then landed back at base. They inspected the damage to find the fire had burned through a spar between two gas tanks. Amazingly, the tanks never caught fire. 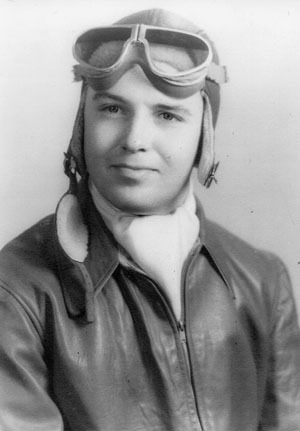 Foos received the Distinguished Flying Cross for his actions. 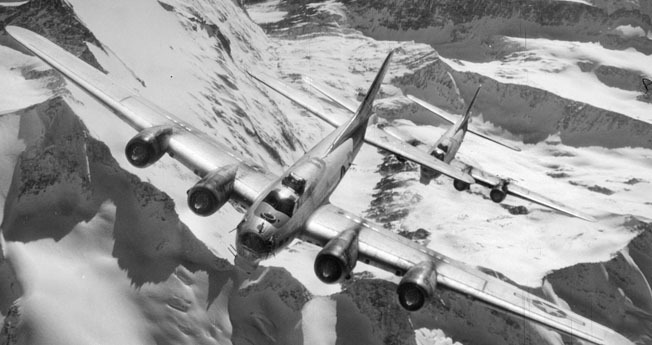 Two B-17 bombers fly over the snow-capped Italian Alps. Fitzpatrick’s bomber once had to cross the Alps on only two engines. There were other dangers. Coming back over the Alps after a bomb run, the bomber hit a downdraft and dropped 5,000 feet in just a few seconds. Fitzpatrick, who never wore his seatbelt at his desk, split his head on the ceiling. Blood oozed out of the wound. With great effort, Foos and Clarke leveled the plane and brought the crew home. Once on the ground, the flight surgeon cleaned and bandaged Fitzpatrick’s wound. He then told Fitzpatrick he could thumb a ride to the hospital at Foggia where they would award him a Purple Heart, or he could go to dinner. Fitzpatrick weighed his options. He had been wounded on a nine-hour mission over enemy territory with a troubled engine that threatened to kill the entire crew. He opted for dinner. The doctor poured him a double shot of good Army whiskey and sent him on his way. “I appreciated that double shot,” he said. With his head wrapped in bandages, Fitzpatrick sat down in the mess hall for dinner. Two new crews who had just arrived from the United States looked at him aghast. “They were probably thinking, ‘What were we getting ourselves into?’” mused Fitzpatrick. The British helped defend the air base from Bed Check Charlie. “A German came over every night and tried to bomb us,” said Fitzpatrick. A British searchlight would pierce the night, followed by antiaircraft fire. “Sometimes they got him,” said Fitzpatrick. “Sometime they didn’t.” When the alarm went off, Fitzpatrick and his crew jumped out of their tents and dove into trenches, sometimes filled with freezing water. “After a while, we just forgot that,” he said. Surprisingly, the Americans got along well with captured German airmen, whom they called their little brothers. “The common denominator was we were all fliers. If you got shot down they would take better care of you than the SS,” said Fitzpatrick. “We treated them the same way.” The POWs enjoyed the same food as the Americans and were allowed to watch the same movies. The Americans sometimes chatted through the wire with those Germans who could speak a little English, but for the most part the POWs kept to themselves and played soccer. One person the American bomber crews did not get along with was their new commanding officer (CO). A West Point graduate who was big on ceremony, he ordered everyone to fall out in their dress uniforms for Reveille. “We hadn’t had that for a year,” said Fitzpatrick. Although the men wore dress uniforms on missions, they usually wore t-shirts and shorts—and some wore kilts—on the base as the weather warmed. For the new CO’s first Reveille only the new crews showed up. Furious, the CO ordered everyone to fall out for the next morning’s Reveille. “We got to those new crews and told them to stay in bed.” No one went out the next day. Again, the CO was furious, but he got the message and gave up on the ceremony. During down time the men stayed at a beach house in Manfredonia, where they could take a sailboat out into the Adriatic Sea or just relax on the beach. “We would go swimming, and girls would come down there completely stripped and put on their bathing suits,” said Fitzpatrick. Unfortunately, he never had the opportunity to go fishing. When Fitzpatrick finally earned some rest and relaxation time, he went on a Red Cross-sponsored trip to Rome. He slept at a mausoleum and toured Vatican City with an American-educated guide named Francesco Federici. They toured the Vatican Library, the Sistine Chapel, and met Pope Pius XII. A group of about 12 Americans were brought to an upstairs room in the Vatican where they waited for the pope. When His Holiness entered the room, the men cheered “Viva El Papa!” The pope then looked at each man’s rank and insignia and spoke to them in English. He then gave a prayer for each man’s family, followed by a papal blessing. As the war wound down, the bombers went on a mission that irritated Fitzpatrick. On March 25, with only six weeks left in the war, the bombers raided a tank factory in Berlin that had already been leveled by the Eighth Air Force flying out of England. 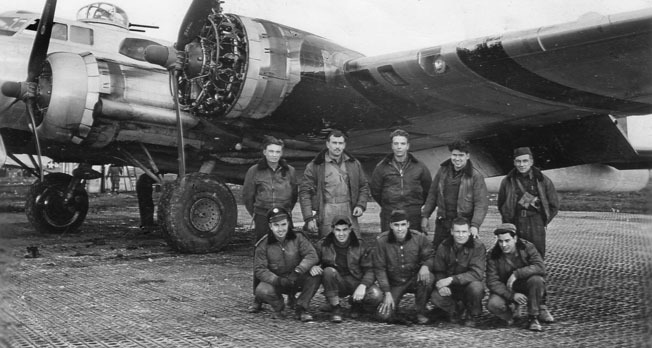 Two bombers and their crews were lost at a time when German civilians often killed downed airmen. “They just wanted to get it into the books that we bombed Berlin with 145 bombers,” he explained. Fortunately for Fitzpatrick, he had rotated out of that mission. “Sometimes the flip of a coin can make a difference,” he noted. On April 25, 1945, the 2nd Bomb Group hit Linz, Austria, followed on May 1 with a mission to Salzburg. On May 6, the Fifteenth Air Force ran out of enemy targets. Three days later, Germany surrendered, and the war in Europe ended. “We went wild and drank wine,” said Fitzpatrick. The ground crews took flares out of the planes, planted them on a hill, and set them off. “We lit 1,000 red flares to celebrate,” he said, “and they burned for a long time.” The Americans opened the POW camp gates, but the Germans refused to leave. They knew their world outside had been destroyed and simply finding food would be difficult. As the days passed, the restless Americans began drinking and getting into fights. Soon their superiors confiscated their firearms. Fitzpatrick and his crew took on a new mission, flying high-ranking officers around Europe. On a trip to Pisa, Italy, he and his flight engineer took a break at a bar. When Fitzpatrick entered, he spotted a friend from Pennsylvania. “Hiya Tom” the friend called out. “Hiya Jim,” Fitzpatrick shot back. It was as if they had not seen each other for just a few days. On a trip to Vienna, Austria, Fitzpatrick went to a hotel where he paid the bar’s piano player a dollar to play “Vienna, the City of My Dreams.” The man played the song. He then played it again, and again, and again. Fitzpatrick eventually had to pay him another dollar just to stop. When Japan surrendered on August 14, Fitzpatrick earned the right to go home. “We were happy when they dropped the bomb,” he recalled about the atomic attacks on Hiroshima and Nagasaki. American fliers had the option of taking a plane or ship home. When Fitzpatrick heard about a plane crash soon after takeoff, he decided to go by ship. He boarded the Victory ship SS Lake Charles Victory where, as one of the highest ranking noncommissioned officers, he was responsible for feeding 500 infantrymen three times a day. He spoiled the returning veterans, giving them extra milk and anything else he could find. He treated them better than himself. “I lost about 20 pounds coming back on that ship,” he said. After 14 days at sea, the Lake Charles Victory pulled into port at Newport News, Virginia. After mustering out of the service, Fitzpatrick and some other veterans rented a car and drove to Washington, D.C. Fitzpatrick then took a train to Philadelphia and a local train home. As he walked up his street, his sister and cousin ran to him and hugged him. When he got home his mother inspected him head to toe. “I passed muster,” he said. Since it was too late in the year to go back to school, Fitzpatrick temporarily returned to his job at the USDA lab, receiving his replacement’s promotions. He eventually earned a degree in chemistry from Penn State University in 1950 and went on to earn a master’s degree from the University of Maryland and a Ph.D. from the University of Massachusetts in 1963. He spent the rest of his career at the USDA laboratory. He bought a house in Flourtown, north of Philadelphia, and decorated his den with the bugle from India (where it hangs today). To him, it represents the end of the British Empire. He moved his parents in to take care of them. “They needed me,” said Fitzpatrick. He got engaged once but never married. “I still have girlfriends,” he muses today. As a biochemist, Fitzpatrick helped invent prenatal vitamins and many other things in use today. After fighting for his country and working at the USDA lab for a combined 40 years of service, he retired at age 55. “Since then,” he said, “I’ve caught a lot of fish.” At age 92 in 2017, he continued to ride horses and hunt big game. Frequent contributor Kevin M. Hymel is a historian for the U.S. Air Force Chaplain Corps and author of Patton’s Photographs: War as He Saw It. He is also a tour guide for Stephen Ambrose Historical Tours and leads a tour of General George S. Patton’s battlefields. Tags Adolf Hitler, Africa, Air Force, Albania, Allies, Alps, Ambulance, Amendola, American, Americans, Ardennes, Ardennes Offensive, army, attack on pearl harbor, Austria, Axis, Axis Sally, Battle of the Bulge, battlefield, Bed Check Charlie, Berlin, blades, Boeing B-17 Flying Fortress, Britain, British, British Empire, Bulgaria, Camouflage, Canada, Charles VI, CIA, cod, Czechoslovakia, Distinguished Flying Cross, EAM, Eighth Air Force, England, Europe, Fifteenth Air Force, Fifth Army, Fighter plane, Flak, Foggia Italy, France, French, French Foreign Legion, general, German, German RADAR, Germans, Germany, Gothic Line, Great Britain, Great Speckled Bird, Greece, Hiroshima, hitler, Hungary, iceland, india, Italian Campaign, Italy, Japan, Japanese, japanese attack on pearl harbor, Jeep, K-rations, lance, Latvia, Linz Austria, lithuania, luftwaffe, machine gun, Mary, Meal, Memphis Belle, Messerschmitt, Messerschmitt Me-262, military, Mississippi, Munich, Mustang, Nagasaki, Naples, NATO, Nazi, nero, New York, Newfoundland, Ney, Norden bombsight, north africa, Odin, Ordnance, OSS, Pacific, pagan, partisan, Pearl Harbor, Ploesti, Pola, Poland, Portugal, POW, POWs, propaganda, RADAR, radio, radioman, RAF, raid, raid on Munich Germany, Red Devils, river, Roman, Romania, Rome, Russia, sam, Sopron Hungary, soviets, Squad, Tanks, Tern, the battle of the bulge, the japanese attack on pearl harbor, The Pacific, Thor, tommy gun, Tory, Troy, Tunis, Tuskegee Airmen, U-Boat, United States, Vatican, Victory ship, Vienna, virginia, war in europe, weapons, WIN, wounded, WWII History October 2017, Yugoslavia, Zero.